Australian building company Project Group held a topping out ceremony for the Nightingale 1 apartment project in Brunswick. The ceremony, which included the traditional tree hoisting, marked a significant construction milestone for the project. Developed on the foundation of wellbeing and liveability, the Nightingale series of apartment projects is highly popular with buyers, considering the 2,000-strong waiting list for future projects. 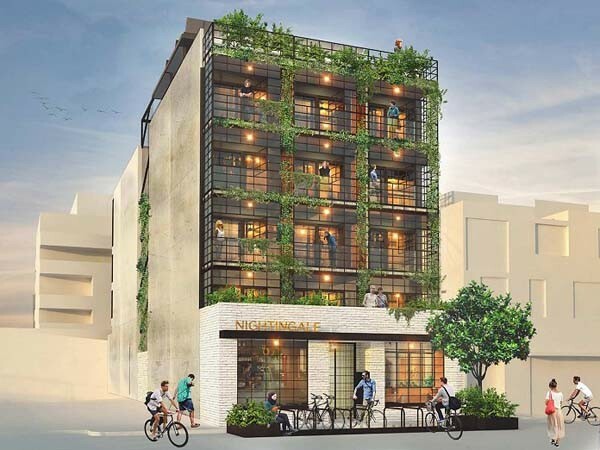 Nightingale's development and financial model uniquely advocates connected communities and sustainability, with capped project profits and a covenant upon resales ensuring affordability is passed on to new buyers. Designed by Breathe Architecture, Nightingale 1, located at 6 Florence Street Brunswick, is a five-storey building consisting of 20 apartments in addition to a retail space on the ground floor and rooftop communal gardens. The project is aiming for an average rating of 8.2 stars, and includes a shared 18kW solar array. Nightingale 1 is expected to be completed later this year. Overall, there are 18 Nightingale projects in development around Australia.